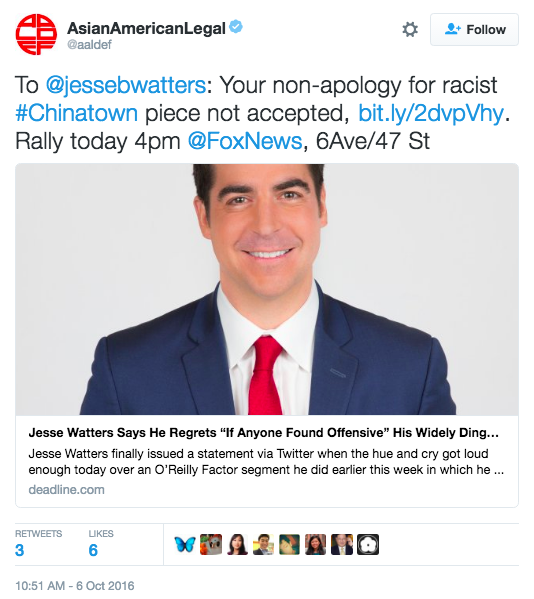 Earlier this week, Jesse Watters, the young Fox News interviewer who hosts a man-on-the-street style segment on Bill O’Reilly’s weeknight show “The O’Reilly Factor,” got major heat for a Chinatown segment that aired earlier this week that people are calling “racist.” According to critics, Watters capitalized on Chinese stereotypes while talking to Asian pedestrians in New York’s Chinatown asking them questions pertaining to China. According to others it was just some comedy, from a typically comedic segment, and people need to lighten up. The idea for the segment came after it was found that the world “China” came up 12 times during the first Presidential Debate between Hillary Clinton and Donald Trump. 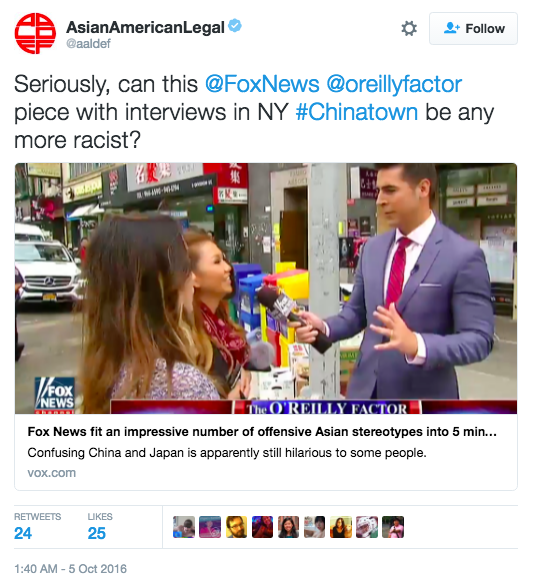 O’Reilly introduced the piece by saying Watters went down to Chinatown to sample “political opinion” but some argue he just went there to mock. Between asking about who they were going to vote for, he made some jokes about the culture. “Am I supposed to bow?” he asked two girls. “Do you know karate?” he asked one man, who then proceeded to punch Watters’ hand upon request. Before ending the segment Watters requested one man tell him how to say the segment’s tagline “this is my world” in Chinese. The Asian American Legal Defense and Education Fund tweeted disgust with the clip. On Wednesday, Watters took to Twitter to express “regret” that his piece, which was meant to be “light,” may have offended people. However, the Asian American group didn’t accept Watters’ apology. After the clip played on The O’Reilly Factor, Bill O’Reilly acknowledged that although Jesse Watters had “gentle fun” making the segment, he predicted that the show was “gonna get letters” from those that may easily get offended. Activists plan to protest the racist segment outside of the Fox News headquarters in New York City on Thursday at 4pm.